In August 2018, I wrote about the Swedish ISP C-Sam ignoring general IT Security. At the time of publishing I informed the ISP via email. I never receive any response from them. Today the friend who is customer at that ISP informed me that he received information from it’s ISP about a shutdown of their email service. The providers set up an information page for customers. Do you use an email address from us? In recent years, the use of e-mail services has changed. More and more people use web-based free services such as gmail or hotmail. 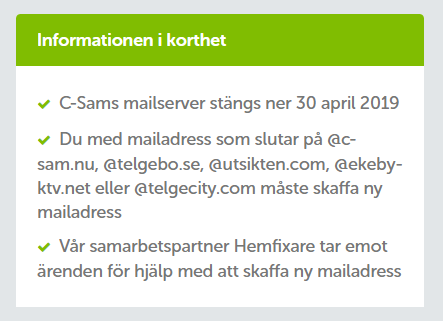 – You with an email address that ends with @c-sam.nu, @telgebo.se, @utsikten.com, @ekeby-ktv.net or @telgecity.com need to create a new email address. In short, we can not offer security for email service due to this we are shutting it down on the 30th of April 2019. This ISP has about 10.000 customers, and is existing since 1992. 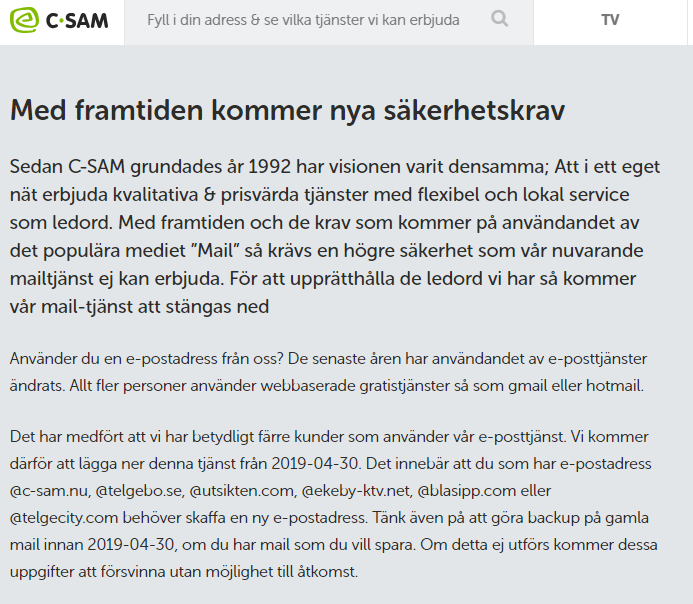 Today in 2019 there are for sure a lot of people who have been customer at C-SAM for over 10 years, using the same e-mail addresses mentioned above for everything. And now, because IT Security is so difficult, they are just shutting down their email service and referring to the information that many customers are using other free web-based e-mail services instead. Just imagine, having your Facebook account, Netflix account, and many other online services connected to an e-mail address that you have been using for many years. Suddenly this e-mail address will be shutdown. At least, they offer a company to contact if you need help with creating a new e-mail address, for just 399 SEK (ca. 38 Euro). The problem is, that the work the user needs to do is not only setting up an new email address. Email addresses are commonly used as a users ID, which means that has to be changed on a lot of services, Netflix, Amazon and other online shops and internet forums. Good luck with that! Never use the email address provided by your ISP. An email address is a part of your identity, who you authenticate as. Use instead a larger well known email provider, like Microsoft (Outlook.com) or others.